There are many ways to help businesses grow, but marketing is the top driver. Marketing is essential because it’s the force that drives sales and generates leads to a business. However, there’s more that marketing brings to a business - from establishing the ideal clientele, building reputation and customer retention. Marketing mechanisms are driven by the target market and consumers demand a strong, consistent and cutting edge digital presence from their suppliers regardless of how large or small the enterprise. It is difficult for SME's and Startups to keep abreast of the constantly changing landscape of digital marketing. While you cannot afford to not be fully engaged with your customers through through digital marketing. It is therefore, essential to seek professional help. Focus on what you do well is never more apparent, especially for startups. Hiring a marketing consultancy with a proven track record and specific targets will produce a measured return. The main goal for marketing agencies is to assist other companies in building their marketing strategies and achieving them. Unlike in-house staff, the line of work marketing agencies do is not limited to one business field. This helps them gain more experience and a comprehensive view of the market. Dealing with expert consultants saves the company’s time. You can imagine the challenges that would lead the company to take risks and waste time on any unprecedented events while a consultant brings past experience and solutions seamlessly. Budget is a deciding factor in favor of marketing agencies when comparing in-house or outside marketing options. The cost that ensues hiring a department of at least 3 staff members (given that the business is still in its early stage or is a small one) is heavy, especially when compared to hiring a company with ready and waiting staff! Also the process of headhunting and finding the perfect specialized member involves time and risk. The success of a marketing consultancy is determined by the marketing performance over set time. Clearly defined goals are set and the consultant works closely with the sales team to tweak and maintain results. Does the ideal customer know about the company? How engaged is the audience with the company (whether on social media channels or through the number of closed sales)? This minimizes the risk companies run when deciding to cooperate with a marketing consultancy. In an ideal marketing consultancy, you will find a number of marketing consultants, from digital marketing specialists to SEO tools expert, each efficiently handling a specific part of the overall marketing strategy for a company. It means that one person is not spread too thinly over several tasks, therefore not achieving consistent results. Do marketing consultancies stand a chance in the UAE? According to Khaleej Times: “UAE startups secured $400 million (Dh1.47 billion) or 84 per cent out of the $475 million (Dh1.74 billion) raised by regional startups last year.” The significant number of startups appearing across the UAE is a signal for marketing consultants to up the ante by starting their own marketing consultancy. 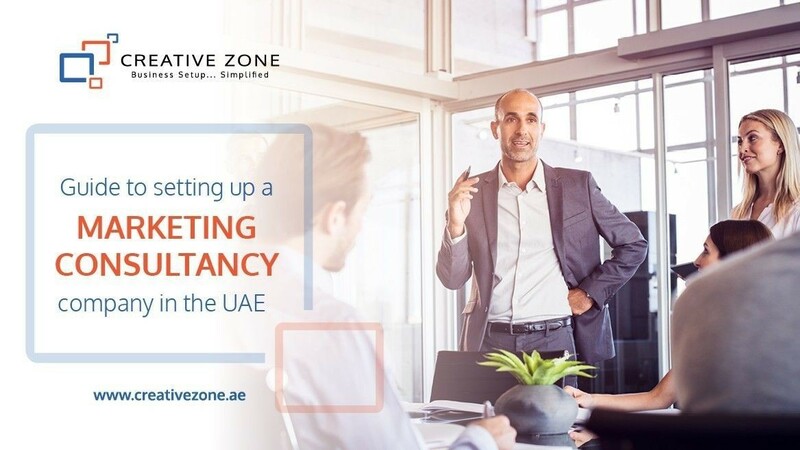 Start your marketing consultancy today at one of the above free zones through CREATIVE ZONE. Find out about our Flexible Payment Plans.